"Centuries ago on the war-torn planet Skaro a great scientist created the most evil creatures the Universe would ever know… Daleks. It was at their genesis that the scientist, Davros, first met and was defeated by the Doctor. Davros survived. Alone. In the dark. With only thoughts of revenge keeping him alive. The Doctor is back. Davros is waiting. Their destiny is now." THAT Classic villain! I shouldn't be so surprised since Davros is all over this marathon, which makes sense. I don't care. What do you think? Was Davros "Genesis" awesome or "Resurrection" awesome in this one? How about the Eighth Doctor? Ok, this one was really good. I was a fan. It was a little confusing at the beginning, but it all comes together really well and proves to be a pretty sweet story. Davros is just completely insane, and that's what makes him such a great villain. I love the thought process - I hate the Doctor and therefore I am going to turn all the humans into Daleks, take control over former companions and then bring the Doctor here to be tortured by it all. I mean, this plan was so ridiculous even the Daleks were turning against him! But, it would be a lot less fun if Davros weren't completely insane. Overall, I found this to be a great listen. It was a little confusing to start, but it eventually all comes together quite well and is a great story. Really cool name. It seems like every other Doctor Who story involves some kind of resistance front and rebellion. I laughed when in this one, the Daleks were the resistance. Davros is definitely becoming insane (if he wasn't before.) I was loving the Gollum-like conversations he was having with himself. Overall, a pretty good story. This was another awesome one. 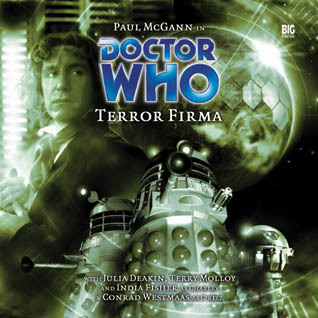 Finally I had an Eighth Doctor story I really liked. At the beginning, I thought there were too many characters but then once Davros revealed what he did, it all worked a lot more. Davros was fantastically mad and I really need to listen to more of K'rizz to get what he's about. This had a lot of really witty dialog, especially most of the opening between The Doctor and Davros. Also I really dug the transitions by having characters repeat words. That was creative!